Cachexia with muscle wasting is prevalent and closely associated with mortality and morbidity in patients with CKD.1 The pathophysiology of muscle wasting in CKD is complex. Inadequate nutritional intake, physical inactivity from muscle weakness, systemic inflammation and aberrant signaling of neuropeptides have been implicated.2 To date, there is no effective therapy. Exercise training has well documented health benefits, including maintenance of muscle mass as well as increased physical performance resulting from changes in muscle fiber phenotype leading to increased mitochondrial biogenesis. The molecular signaling mechanism underlying adaptations to increased physical activity in CKD-associated muscle wasting is not well understood. Wang et al.3 investigated microRNA-23a (miR-23a) and miR-27a, located in an NFAT-regulated gene cluster, as potential candidates for exercise mimetics in mice with CKD cachexia. miR-23a expression is decreased in mice with CKD. Resistance overload exercise increased muscle miR-23a and miR-27a expression in CKD. In vivo transfection of miR-23a/miR-27a cluster precursor in CKD mice attenuated muscle wasting, improved grip strength, and corrected the aberrant signaling of ubiquitin ligases, muscle ring finger 1, and atrogin 1, which are the signature of muscle wasting in CKD. 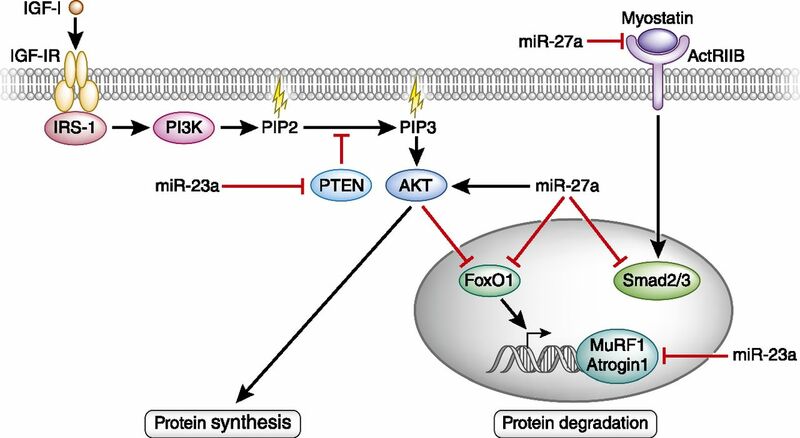 In silico analysis identified PTEN and caspase-7 as targets for miR-23a and Fox-O1 as target of miR-27a in muscle. The authors concluded that the miR-23a/miR-27a cluster might play an important role in the molecular signaling of exercise-induced adaptations in CKD muscle and suggested that this pathway may provide the basis of pharmaceutical exercise mimetics for CKD cachexia and wasting. Wang et al.3 explored the molecular mechanism of the effect of the miR-23a/miR-27a cluster on CKD-associated muscle wasting by focusing on the atrophy-related signaling. They showed improvements in Akt/FoxO signaling, caspase-3–mediated proteolysis, muscle regeneration pathway, and myostatin signaling as well as inflammatory cytokines. Furthermore, they performed in silico exploration and identified PTEN and caspase-7 as potential molecular targets for miR-23a as well as FoxO and myostatin for miR-27a. In addition to maintaining muscle mass or preventing muscle wasting, exercise training is known to trigger in skeletal muscle remodeling that progressively enhances substrate utilization; this acts to reduce muscle fatigue, leading to improved muscle strength and performance. Furthermore, exercise training can cause muscle fiber type remodeling from less to more oxidative fibers, leading to high maximal oxidative capacity and improvement in exercise endurance. Wang et al.3 did not investigate whether miR-23a/miR-27a has an effect on substrate utilization or muscle fiber–type remodeling. A summary of miR effects on skeletal muscle biology in CKD with respect to pathways related to exercise mimetics is summarized in Figure 1. Molecular targets of miR-23a and miR-27a as exercise mimetic in CKD wasting. MuRF1, muscle ring finger 1. Furthermore, exercise training leads to multiorgan adaptations in addition to those shown in skeletal muscle. Thus, it would be simplistic to attribute the multiple health benefits of increased physical performance from exercise training to merely adaptations in skeletal muscle phenotype and genotype. Physical inactivity has been recognized as a major health hazard responsible for modern epidemics of lifestyle disorders, such as cardiovascular disease, obesity, and type 2 diabetes.15 Although not established as yet in CKD, the same pathophysiology may be similar. Thus, exercise mimetic for treating muscle wasting is an interesting and novel approach, but its validity in improving cachexia and its associated mortality and morbidity effects needs to be established in more robust rodent and human studies before it can be established. See related article, “MicroRNA-23a and MicroRNA-27a Mimic Exercise by Ameliorating CKD-Induced Muscle Atrophy,” on pages 2631–2640.